Our parish has its own consecrated cemetery located in East Herkimer, NY. The cemetery has room for over 1400 graves with some 400+ faithful interred to date. For more information regarding administration of the cemetery, contact Mr. John Ciko at (315) 866-5825 or write to him at our parish address. 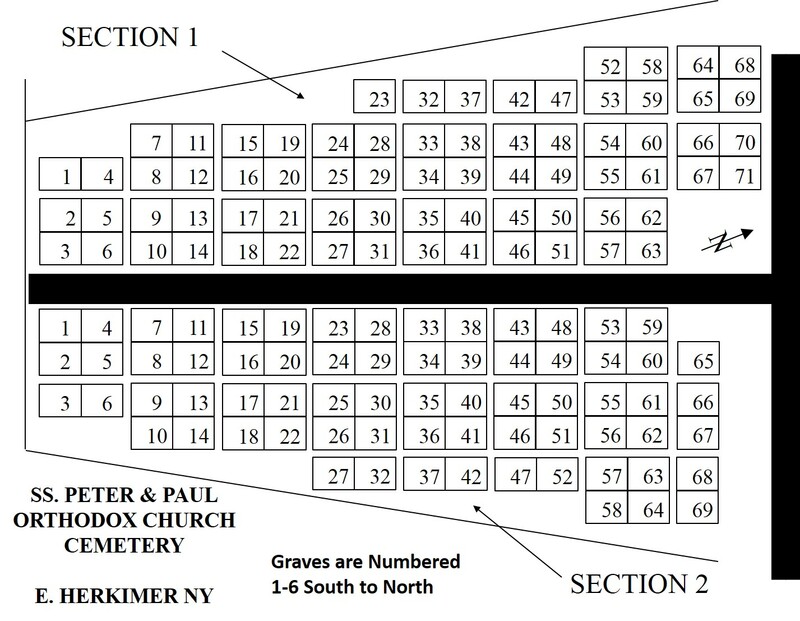 Our cemetery is located at the corner of Main Road (NYS Route 5) and Smalls Bush Road east of East Herkimer, just 3/4 of a mile from our church. An index of graves is currently being prepared for inclusion on this webpage. 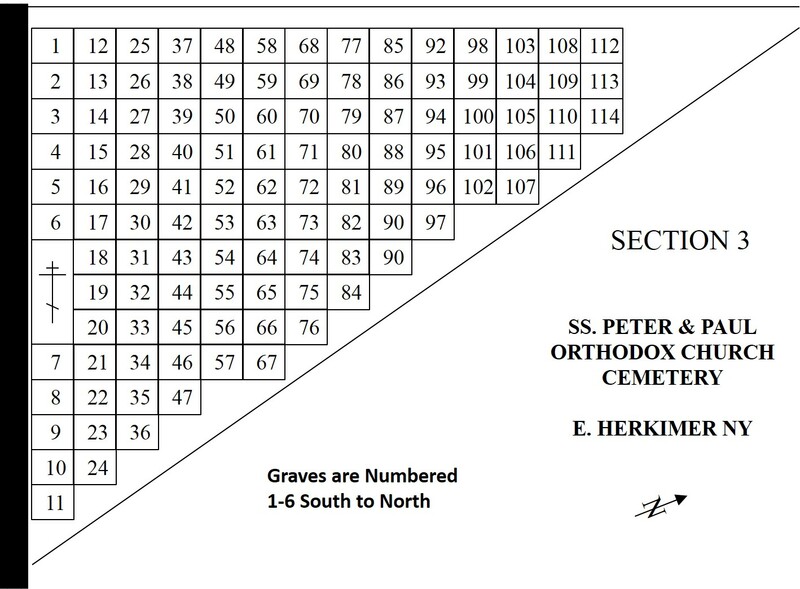 An unofficial record of graves can be found at http://herkimer.nygenweb.net/cemeteries2/stpeterpaulcem.html. The data at these sites not been reviewed and its accuracy is not guaranteed. After our parish was established, a church building erected in 1922 and a priest assigned as rector, the next step in the early life of the parish was to arrange for the proper burial, in sanctified ground, of reposed members. As the parish grew it became obvious that it was time for a dedicated cemetery under the direct control of the parish. Land was purchased in 1932 and consecrated to its sacred purpose on Aug 9, 1935, with Metropolitan Theophilus of New York officiating. Herkimer – Sts. Peter and Paul’s Russian Orthodox Cemetery on Route 5 between Herkimer and Little Falls was dedicated yesterday in impressive ceremonies by the bishop of all the Russian Orthodox churches in the United States and Canada. His Eminence Metropolitan Theophilus, New York. More than 400 were present. (Met. THEOPHILUS, 1874-1950, successor to Met. PLATON in 1934, succeeded by Met. LEONTY in 1950. – Ed.) The dedication services opened in the morning at a service conducted in Sts. Peter and Paul’s Church in West Steele Street, Herkimer, at which the bishop officiated. The bishop, who is a guest at the parsonage, was greeted at the door by 14 flower girls, who led a procession from the parsonage to the church, sprinkling flowers enroute. The flower girls were: Tina Homka, Olga Hovanic, Betty Bruska, Helen Kluka, Vera Senyk, Minnie Kluka, Catherine Kuzenic, Vera Ptasznic, Nina Homka, Anna Alexczuk, Anna and Nellie Sokol, Irene Lechmanic and Helen Bius. Following the service the entire congregation, augmented by parishioners from Cortland, Syracuse, Binghamton, Cohoes, Watervliet, Auburn and Endicott, went to the cemetery, located on Route 5 between Herkimer and Little Falls. Here the bishop, assisted by Deacon Innocense- Semoff, officiated at the cross in the cemetery and concluded the ceremony by marching around the burial ground, blessing the land. The Rev. Joseph Banitt, Watervliet, spoke at the service, lauding the Herkimer congregation for its endeavor. 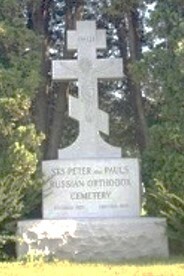 Practically all of the services, both at the church and burial ground were conducted in Russian. Assisting clergymen were the Rev. Gregory Homka, Herkimer, the Rev. Nicholas Metropolski, Syracuse, and the Rev. John Stroyan, Cohoes. The Syracuse chorus sang at the burial ground, while the Watervliet chorus gave a concert at a banquet held later at Stop 38. Other speakers at the banquet included Juvenile Judge F. A. McCarthy and District Attorney Carl W. Peterson. The services also marked the 20th anniversary of the establishment of the Russian Orthodox Church in Herkimer. The cemetery dedicated was purchased by the local church three years ago. Altar boys who served the bishop were George Eskoff, Stephen Bius, Alexander Alexecuk and Walter Bruska.